Sigh... Most movies that have climbing and mountaineering in them are bad. Some are mediocre and a very small percentage of them are good. 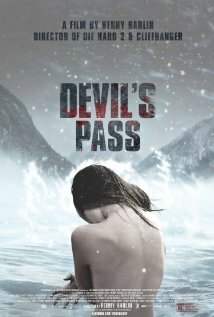 Devil's Pass, one of those easily found Netflix films, is also one of those mediocre films. You don't feel like you wasted your time unless you had something better to do. If you have something better to do, then you should probably do it. But if not, then maybe Devil's Pass might be a good way to burn ninety-minutes. The incident involved a group of ten from Ural Polytechnical Institute who had set up camp for the night on the slopes of Kholat Syakhl. Investigators later determined that the skiers had torn their tents from the inside out. They fled the campsite, some of them barefoot, under heavy snowfall. Although the bodies showed no signs of struggle, such as contusions, two victims had fractured skulls and broken ribs. Soviet authorities determined that an "unknown compelling force" had caused the deaths; access to the region was consequently blocked for hikers and adventurers for three years after the incident. Due to the lack of survivors, the chronology of events remains uncertain, although several explanations have been put forward, including a possible avalanche, a military accident, or a hostile encounter with a yeti or other unknown creature. This true life incident is one of those Twilight Zone/X-Files type things that occasionally appears in mountaineering literature. It's a great premise for a science fiction/horror film. But then they decided to hire Renny Harlin to direct the film. Harlin is one of those directors that tends to work on half-assed genre films. He's responsible for such luminary works as Die Hard 2: Die Harder and the Andrew Dice Clay vehicle, The Adventures of Ford Fairlane. But most climbers will remember his signature outdoor film accomplishment: Cliffhanger. So without going any further, you pretty much know that there are going to be problems with the film. The story is primarily done as a found footage piece, with Holly King (Holly Goss), a young student leader who wishes to make a documentary on the Dyatlov Pass incident. And of course, to do so, she needs to put together a team to make a trip to the pass. The team includes a filmmaker (Matt Stokoe), a sound woman (Gemma Atkinson) and two guides (Ryan Hawley and Luke Albright). The problems start early in the story. For example, when you choose a guide, he probably shouldn't be under 25 and tell everyone that "I've pretty much climbed every mountain that matters in the US and want to go other places." Sure, he might be experienced. But he's not Fred Beckey. That arrogance alone means that you're liklihood of survival is going to be low. Add monsters, and there's no way you're going to make it back. Shortly after that, we find out that the "guide" also hooks up with one of his clients on every trip. He calls them "trail hookups" and videotapes them. Did I mention that they find a human tongue? Yeah... They do. And for some reason they keep on going. The guides are really really bad. And the motivations for all of them to stay on the mountain are really really bad. It doesn't make much sense.